How the heck not, vacantlook? I haven't yet commented in this thread, so you're obviously not talking to me. I think it's my post he or she is referring to.But that's one of things I don't like .I mean it seemed from the minute Sheridan came on board I knew Delenn was going to marry him As you can see I am not a big Sheridan fan .That would have been one of the best parts of the series if she hadn't married him .I always thought Delenn deserved someone else other than Sheridan Starkiller. It would've been funny if she'd played it straight right up to that scene in Season 4 where Sheridan finds the engagement ring under the chair, makes his little speech about downpayment on a wedding ring, and then turned him down. That would've been one hell of a twist.. I enjoyed this episode considerably more after listening to JMS commentary. It was a storke of writing genuis to have the actors unaware of the direction that this episode would take. Ex 2) Garibaldi's second in command character was changed dramatically to the "bad guy" in this episode, another example of a change that the actor was not aware of. Both examples illustrate that JMS was building a saga, with events and actions hinted in whispers that would alter the course of the entire show later on. Totally, I know what you mean. I love those storkes (they taste like chicken). Storkes taste like duck not chicken! True. And JFK kind of tasted like Quale. Another excellent episode. Great action, great tension (Garibaldi crawling towards the lift, can he warn about the assasination atempt in time? )a great mysteryand wonder. Everything starts to hit the fan here, like Sinclair says, "Nothing's the same anymore..." It would have been interesting to see just where things would have led had Michael O'Hare stayed with the show. Would it have been Catherine Sakai mysteriously returning from Z'Ha'Dum at the end of season three, not Anna Sheridan? We get our first proper look at the Shadow's vessels in battle, and the destruction of Earth Force One is a major turning point. And then right at the end we get our first glimpse of the Shadows themselves. I thought this was a fantastic episode the first time round, and I still get a thrill watching it now, because there is a feeling that anything could happen, the audience knows it, and by the end the charcters have come to know it. Awesome .. there is no other word for it. 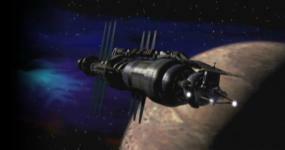 This episode converted me to a complete fan of Babylon 5 in 15 minutes. I had never seen any of it properly before sitting down to see the last half of the episode .. once it was done, I was rushing to the closest book store looking for episode guides and trying to figure out how many more episodes there would be and got VHS tapes to tape every last episode of it - an honour that at the time was only reserved to one other TV show - Star Trek. It would have been interesting to see just where things would have led had Michael O'Hare stayed with the show. Would it have been Catherine Sakai mysteriously returning from Z'Ha'Dum at the end of season three, not Anna Sheridan? For the last time: NO!!! Sakai would never have had the role of Anna Sheridan because of one tiny detail: the Shadows had already been awoken in Season 1. And there would be no blowing up Z'ha'dum, no Lorien, no ISA, etc. JMS already said this a dozen times: Sheridan wasn't created to replace Sinclair with the same character but a different name, any more than Lochley was there to play the role of Ivanova; they were different characters with different unrelated arcs. That same mistake of transfering one character to another led a lot of people to think that Ivanova would end up with Takashima's mole arc, which was not the case.